Be the first to share your favorite memory, photo or story of Mrs. Sarah. This memorial page is dedicated for family, friends and future generations to celebrate the life of their loved one. 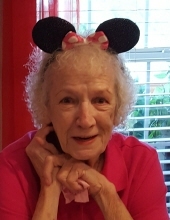 Mrs. Sarah Broadwater Pope, 81, entered into rest on Saturday, January 26, 2019. She was preceded in death by two sisters, Dorothy Foster Dubose and Roberta Foster Jackson and a brother, Charles Foster. Born in Aiken County, S.C. to the late Lenwood Foster, Sr. and Margaret Carroll Foster. Mrs. Pope was a lady with many interest and talents and always in pursuit of knowledge. She worked her entire adult life in many capacities. In her forties, she went back to school to obtain a degree as a Machinist. She was one of the first women to run a training program in the textile industry where she traveled all over the south teaching. Her children said that she learned from her father how to do carpentry and then helped build a workshop for her wood crafts. She enjoyed gardening because no matter what happened if you had your own garden you could take care of yourself. Surviving are her two daughters: Margaret “Marty” Dodson (Joe), of Gaston, SC and Rhonda "Paula" Broadwater, of Aiken, SC, a son, Richard Busch (Donna), of Aiken; a sister, Vivian Foster Creech, of Belvedere, SC and a brother, Lenwood Foster, Jr, of Beech Island, SC; four grandchildren: Ross Beasley (Cretia) Lexington, SC, Tripp Bone Gaston, SC, Rick Busch and Daniel Busch; four great-grandchildren: Chloe and Ryland Beasley and Alton and Robert Dozier Bone; her aunts: Emily Greatsinger (Steve), of Aiken, SC and Florence Foster, of Greenwood, SC, many nieces and nephews and her four-legged pal, Rocket. The family will greet friends on Tuesday beginning at noon at Hatcher Funeral Home and Cremation Service, 3464 Jefferson Davis Highway, Graniteville, SC 29829. A Celebration of Life service will follow at I o’clock in the Hatcher Funeral Home Chapel with Rev. Heyward Horton officiating. To send flowers or a remembrance gift to the family of Mrs. Sarah Broadwater Pope, please visit our Tribute Store. "Email Address" would like to share the life celebration of Mrs. Sarah Broadwater Pope. Click on the "link" to go to share a favorite memory or leave a condolence message for the family.